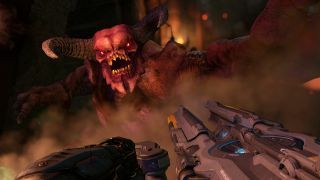 Hat’s off to DraQu who now holds the world record for playing Doom really, really fast. His current time is 1hr 29mins and 58secs, so just a hair under 90 minutes. He played on easy and used a host of tricks to get to this point, having refined his original 1hr55min down run through repeated attempts. Along the way he started using the Gauss gun to boost his jumps for extra speed, and found two out of bounds exploits (getting outside of the playing area to skip whole sections of the game) in Titan's Realm & The Crucible. While 89 and a bit minutes sounds pretty impressive DraQu thinks he can do better saying “I added two seconds to the time because I started the timer a bit too late. The start of the run was bad and some fights were slow. Will be improved!” He’s also got a 1:41:45 playthrough on nightmare difficulty if you thought the easy playthrough was cheating.